For 56 years, Imperial Valley school children have heard the message of water safety from Imperial Irrigation District (IID.) This year celebrates the 50th anniversary of Dippy Duck, the beloved water safety mascot. Even though the Imperial Valley's extensive canal system is posted with No Trespassing signs to keep people away, the IID Board of Directors decided early on that more was needed to protect the Valley's most precious resource - its children. A comprehensive water safety program was launched in 1959 to create a psychological fence in children's minds, since a real fence around the system would cost an estimated $5 billion (pre-inflation dollars) and be long enough to stretch all the way from San Diego to New York and back. 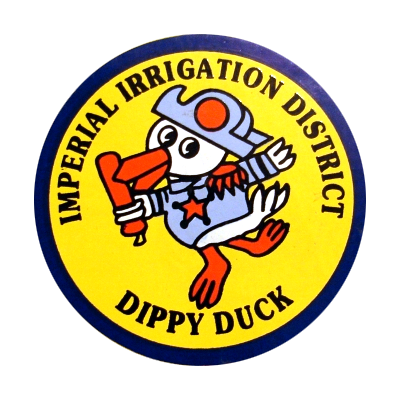 IID's cartoon mascot made his debut in May 1966 and was based on a real duck who survived a trip through a power-plant turbine on the All-American Canal. Legend has it the little duck came out alive but featherless! And while Dippy's look may change with the times, through the years his message remains constant: Never swim in a canal, Never play near a canal, Never jump into a canal.